Cost of goods sold showed a 19% increase closing the period at $39.52 million relative to $33.27 million for the corresponding period in 2016. For the quarter, the company recorded a 22% increase in cost of goods sold to close at $21.70 million relative to $17.72 million for the comparable period in 2016. Consequently, CPJ recorded an increase in gross profits to $14.39 million (2016: $12.76 million). Gross profits for the quarter however improved from $7.27 million in 2016 to $7.84 million. Selling and administrative expenses were $10.46 million, an 11% increase on the $9.45 million posted for the prior year. The company stated that, “salary related expenses, repairs & maintenance” contributed to the increase in expenses. Depreciation for the period fell by 6% closing the period at $1.25 million (2016: $1.33 million). Other operating income totaled $31,813; this compares with an operating income of $18,851 booked in 2016. Profit before finance costs, income and taxation improved 32% to total $2.65 million relative to $2 million in 2016. Finance costs amounted to $849,205 (2016: $895,245). Finance income decreased by 74% to close at $203 (2016: $767). As such profit before taxation was $1.80 million compared to a profit of $1.10 million in 2016. Net profit attributable to shareholders for the six months amounted to $1.46 million (2016: $972,554). While for the quarter, net profit amounted to $1.07 million relative to a net profit $1.25 million booked last year. As a result, earnings per share (EPS) for the six months amounted to US0.133 cents compared to US0.088 cents in 2016. 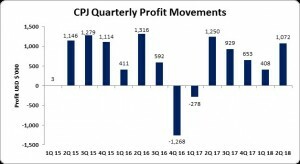 EPS for the quarter amounted to US0.107 cents relative to US0.117 cents. The number of shares used in our calculations amounted to 1,100,000,000 units. CPJ closed trading on February 13, 2018, at J$4.45. As at December 31, 2017, CPJ’s total assets amounted to $61.23 million, an 8% increase from the $56.72 million booked in 2016. Shareholder’s Equity totaled $22.87 million (2016: $20.35 million) resulting in a book value per share of approximately US2.08 cents (2016: US1.85 cents).